Fdr and the Jews by Richard Breitman (English) Paperback Book Free Shipping! David Cesarani's Final Solution is a magisterial new history that chronicles the fate of Europe's Jews. Based on decades of scholarship, documentation newly available from the opening of Soviet archives, declassification of western intelligence service records, as well as diaries and reports written in the camps, Cesarani provides a sweeping reappraisal challenging accepted explanations for the anti-Jewish politics of Nazi Germany and the inevitability of the Final Solution. The persecution of the Jews, as Cesarani sees it, was not always the Nazis' central preoccupation, nor was it inevitable. He shows how, in German-occupied countries, it unfolded erratically, often due to local initiatives. For Cesarani, war was critical to the Jewish fate. Military failure denied the Germans opportunities to expel Jews into a distant territory and created a crisis of resources that led to starvation of the ghettos and intensified anti-Jewish measures. Looking at the historical record, he disputes the iconic role of railways and deportation trains. From prisoner diaries, he exposes the extent of sexual violence and abuse of Jewish women and follows the journey of some Jewish prisoners to displaced persons camps, the latter sometimes merely seen as a mere footnote. David Cesarani's Final Solution is a fresh look at the fate of a heroic people caught in the hell that was Hitler's Germany. 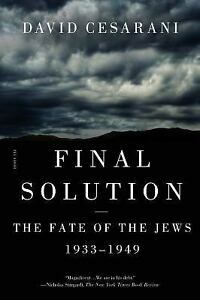 David Cesarani's Final Solution is a magisterial work of history that chronicles the fate of Europe's Jews. Based on decades of scholarship, documentation newly available from the opening of Soviet archives, declassification of western intelligence service records, as well as diaries and reports written in the camps, Cesarani provides a sweeping reappraisal challenging accepted explanations for the anti-Jewish politics of Nazi Germany and the inevitability of the Final Solution. The persecution of the Jews, as Cesarani sees it, was not always the Nazis' central preoccupation, nor was it inevitable. He shows how, in German-occupied countries, it unfolded erratically, often due to local initiatives. For Cesarani, war was critical to the Jewish fate. Military failure denied the Germans opportunities to expel Jews into a distant territory and created a crisis of resources that led to the starvation of the ghettos and intensified anti-Jewish measures. Looking at the historical record, he disputes the iconic role of railways and deportation trains. From prisoner diaries, he exposes the extent of sexual violence and abuse of Jewish women and follows the journey of some Jewish prisoners to displaced persons camps. David Cesarani's Final Solution is the new standard chronicle of the fate of a heroic people caught in the hell that was Hitler's Germany.